Our heavy duty, commercial-grade double jockey box is equipped to pour from your keg of beer, wine, coffee, kombucha, tea, etc. with two taps, all fitted with a CO2 or nitrogen system. 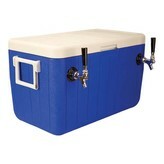 Complete your keg purchase with a jockey box to serve refreshments at your party.